How much felt is enough, stock that is! How much felt is enough for a display table or booth, enough that is to create a good display, have a selection of different items in different colours yet not have so much out that things look messy and don’t create a good impression??? 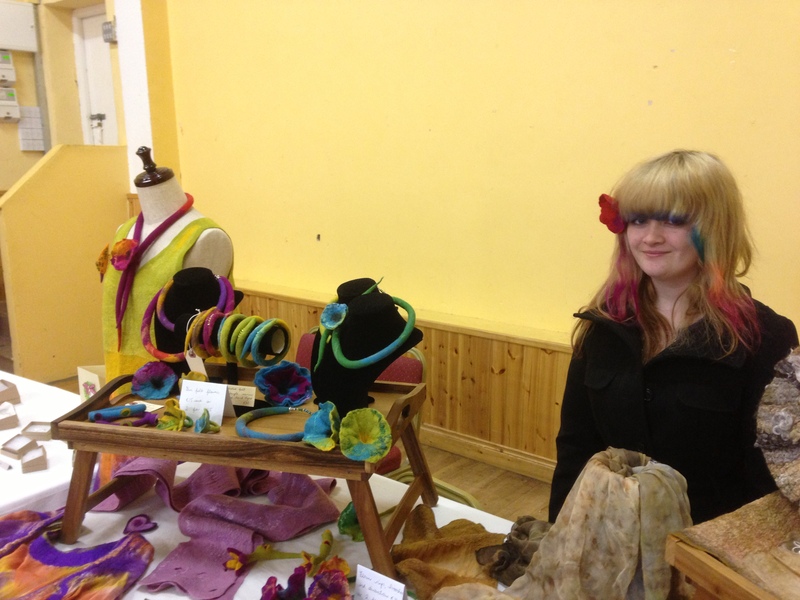 Katie dyed her hair to match the gorgeous flower she felted yesterday, FUN! Because of the various different events I’ll be participating in over the next 5 weeks I’m very conscious that I need to have stock to replace sold items too. I’m not however going to do as someone suggested and hold items back for the bigger fairs, the last thing that I want to do is presume people will buy at these and not offer everyone at my regular gigs an equal opportunity to buy my items. After all, they’re the customers who support me throughout the year so if anything they deserve the pick of the crop in my opinion! A sale is a sale is a sale, all money gratefully recieved and the sooner the better as far as I’m concerned!!! Katie’s finished her week with me as part of her transition year (4th year in the school she attends) work experience. It was interesting having her with me as I usually work totally on my own and a second opinion was definitely a help at times. In addition to being out and about facilitating two sessions with Borris Active Retirement, a birthday party for a 9 year old and Borris Food & Craft Market this morning we managed to naturally print/dye over 24 scarves on Tuesday and have a big pot of cochineal on the go yesterday, a busy and satisfying week I think! Thanks Katie for all your help, it was a pleasure having you at Clasheen. 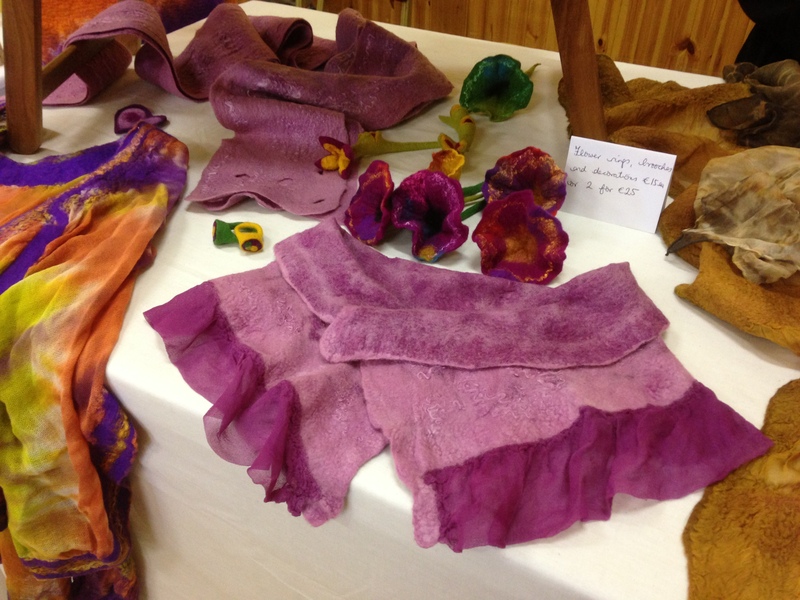 This entry was posted in Craft Fairs/Events, Dying, Fairs/Events, Felt, Felt for sale, Natural printing and dyeing and tagged Borris Food and Craft market, cochineal, Felt, natural dyeing, natural printing, nuno felt by Nicola. Bookmark the permalink. What a lovely, unique and interesting work experience! Fantastic that you had Katie’s help….great experience, I’m sure, for her and great timing for you, having the extra help during this busy season. I love your beautifully dyed creations…Gorgeous!